Adventures in Kimchi: Korean-American burgers at Eat Street Markets! Korean-American burgers at Eat Street Markets! 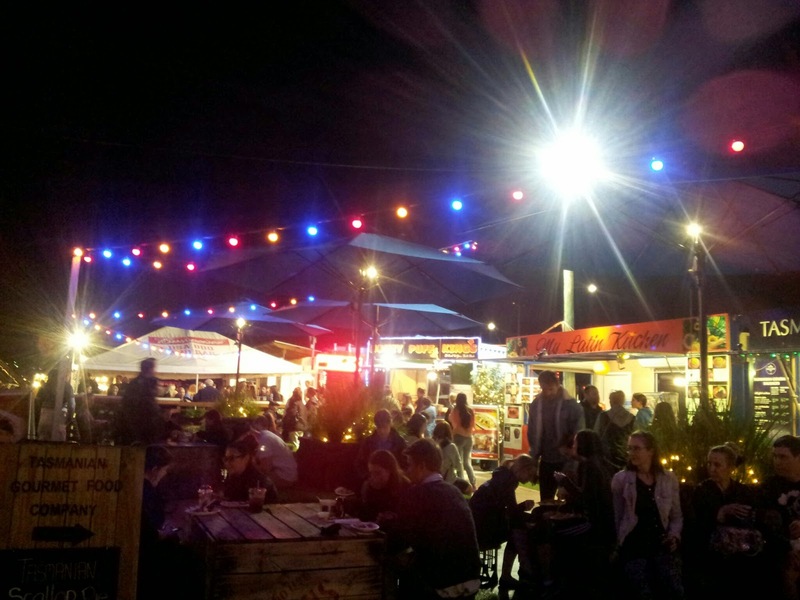 In Brisbane over these past few months, the river-side suburb of Hamilton has been host to some food and indie goods markets called Eat Street Markets. The markets themselves covered a wide area, probably at least 5,000 meters squared! (According to my rough Google Maps estimate.) Inside, there are various stalls build out of shipping containers selling every kind of cuisine imaginable, from American ribs, Asian, Mexican, South American, probably more that I didn't even see! There were also independent artisans selling their craft - homemade greeting cards, decorated lamps or something like that. I found this great place called Korma Sliders which of course does Korean inspired "sliders" - mini, often gourmet style burgers small enough to eat 2 or 3 in one sitting. There was a choice of 3 different meats - chicken, beef, or pork in Korean sauces - bulgogi for the beef, honey-miso for the pork belly (of course pork belly, it's Korean! ), and spicy barbecue on the chicken. The beef was cooked well, nice and tender and juicy, and in small enough pieces that you could still take bites out of the burger without loosing the rest of contents. The bulgogi marinade seemed fresh like they'd made themselves - not that I'd truly expect otherwise. It came with a kimchi-slaw for the salad which is like ordinary coleslaw, but with kimchi possibly in place of the onion. The various flavours worked really well together to a make a fantastic little burger. I got the bulgogi beef slider. As a side dish I got sweet potato fries with aioli, topped with kimchi-cheese! That is, literally kimchi and grated cheese. This was a fun dish because fries, cheese, kimchi! The kimchi was pretty good, fermented a while and not sweetened with sugar. I went to a Korean restaurant the other day and the kimchi didn't taste great even though it was a Korean restaurant. My friend (hi Zoe!) suggested that it was because they added sugar to it for the Western customers. So, luckily this place didn't do that, it was rich and deep. with garlic. The grated cheese was cheddar I think and it melted into the fries and the kimchi complementing each other. My only complaint was that the fries themselves were not crisp, but then, I think sweet potato fries are harder to get crispy than normal potato fries.